As far as this specific situation goes, I don't think Dr Mariano is out of line. 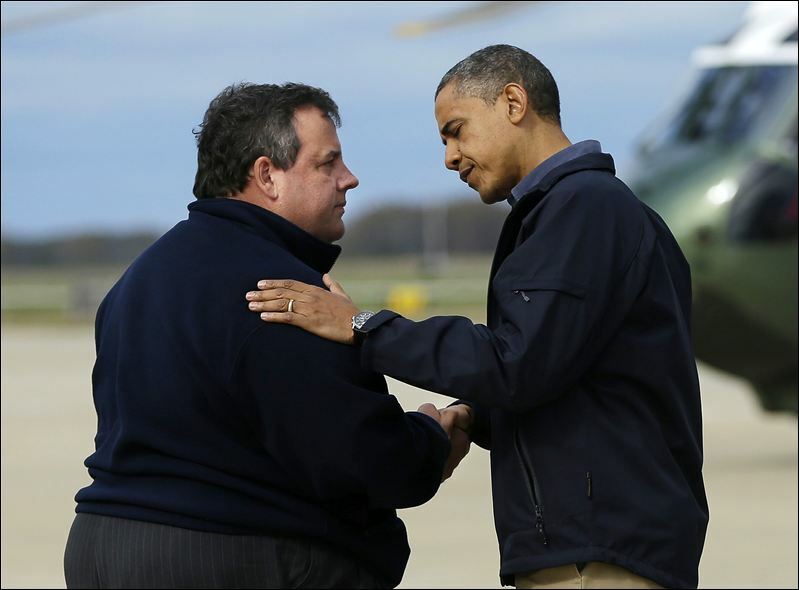 One doesn't need to perform a complete physical examination (beyond asking the Governor to step on a scale) or have access to his medical history in order to arrive at the conclusion that Christie is in fact "morbidly obese" and therefore falls into the category of those who are at higher risk of developing a multitude of obesity-related complications (coronary artery disease, strokes, degenerative joint disease, hypercholesterolemia, diabetes etc). It's rather evident. This doesn't have to be a New England Journal of Medicine case study for CME credit. The dude is extremely obese. It's right there in front of one's nose. And we know that obesity predisposes one to the aforementioned co-morbidities. If the rotund Governor walked into my office with a bothersome umbilical hernia I would feel obliged to recite a scare list of possible post op complications and how, if he didn't try to lose some weight before surgery, he was looking at a much higher expected rate of wound problems and post op cardiopulmonary complications. The issue raised, however, transcends Christie and morbid obesity. In an age of instantly available information, an age where the public seems to have an unquenchable thirst for data, one must ask where we draw the line on what an appropriate query would be for citizens running for public office. How transparent ought a candidate's medical record be? FDR couldn't stand from complications of what was likely Guillian Barre Syndrome. He concealed this inconvenient fact from the general public over the course of three terms (via staged public appearances and the assistance of a compliant press.) Should FDR have been obligated to be more forthcoming? And how would that have affected his electoral chances? What would have been the effect on the Depression and WWII? John McCain released all his medical records prior to the 2008 election in order to ease voter concerns about a 71 year old man who carried a known past diagnosis of melanoma. Some balance between transparency and opacity is needed. A public official deserves some element of privacy, but ailments which could affect one's performance deserve a public airing. Dr Parks: If we decide that it is OK to predict the health status of the morbidly obese because we can easily "see" that problem, what about "problems" we cannot see? 8. Letting your dog or cat bite or scratch you so you get a Pasteurella laden abscess that has to be I&D by a General Surgeon. 9. Getting silicone breast implants that rupture and cause infection or lymphoma or some other horrible problem. 10. Being a patient in any hospital for almost any reason and getting c diff or MRSA, CAUTI, CLABI or HCAP--no matter what your weight--but,just because you are "there". And what about the PCP's of morbidly obese patients who do not, in a timely manner, refer them to a bariatric surgeon for an evaluation and review of options (band, sleeve RYGB)? Morbid obesity is a multi-factorial problem with potentially serious co-morbid conditions. One does not have to be obese to have obesity-associated comorbidities. Let's learn not to judge a book, even a fat book, by its cover. I agree with Governor Christie, let the presumptuous MD review his hx and do a physical before making a pronouncement about his general state of health. I think you misunderstand. All the things you list fall under the category of "private information". No one is demanding to go digging into the private medical/travel/sexual history of potential candidates. All I am saying is that those things which are already in the visible or written public sphere (morbid obesity, jaundice, sudden emaciating weight loss, known history of alcohol abuse) are fair game. A candidate who desires to be senator or president ought to have no problem with providing reassuring information to assuage any unwarranted or exaggerated fears. It's a 4, possibly 8 year job. The only relevant inquiry is whether the medical condition is going to have a negative effect on his ability to perform the job for that amount of time. Unless he has complications that already manifested themselves, I don't care about the possibilities. The White House chef will likely keep him healthy enough to serve without an issue. I lean toward privacy in this debate, particularly given the ability of an opponent to unfairly use the perception of disability as a negative campaign tactic. Let's focus on good ideas, and not scare away a potentially good candidate because of a fear that some medical condition will be made public. (Not Christie necessarily, but some other hypothetically good candidate). And in your list of past presidents, don't forget JFK. He had a degenerative spine condition that left him barely able to sit or stand without huge amounts of pain medication, and yet he had the public persona of a young, vibrant leader. I think she was out of line, and just ruined herself too. He's not even her patient. She just violated trust with her current and future patients. If he can do the job well - fat, thin, sick, or whatever. I just don't care. The world is full of brilliant and successful working sick. I do not misunderstand. Your fair-game supposition automatically equates obesity with poor health, which, with no supporting diagnostic facts (which are private) is not likely to be accurate. You may be aware of the "obesity paradox" which proves that conventional thinking about levels of obesity and associated health and longevity, are flawed. Granted, the statistics on those w. BMI > 40 are not so good, but they are not an absolute "given". How can the public know the full health status of candidates without divulging additional information? They can't. So where do you draw that line? Only the fat candidates need a health clearance but the promiscuous thin guy (Eliot Spitzer comes to mind) isn't asked to take an HIV test? This (Chris Christie) issue is a bothersome point because of the known bias in society and in healthcare against the morbidly obese. I could care less about the political aspect but care a great deal about the sociological practice that promotes prejudice based on physical appearance. Again, smoking is the established #1 preventable cause of death and yet we have elected numerous "smokers" to the White House including Obama. What about candidate John McCain, well into his 70's, should he have needed a medical clearance to run, since the risk of all diseases, not to mention death escalates simply due to advanced age? Let's agree that fat-bias is the last acceptable form of bigotry.